Before his daughter Ellice was born, Mark Bledsoe, of Federal Way, crawled through his house. He was surprised at the potential hazards he encountered from that perspective. Dangling speaker wires and connector cables that he hadn't paid attention to before now looked like strangling hazards for the baby that he and his wife, Grace, were about to bring home. When Bledsoe stuck his hand under their leather sofa, the way exploring babies will do, his hand was punctured by one of many industrial-sized staples in the upholstery. He also noticed some large vases that seemed to scream, "Tip me over!" "The truth is that everyone thinks about the easy things like child locks on cabinets and edge protectors on table corners, but I don't think it's as common to reach under your sofa," says Bledsoe. Denise Goeke teaches baby safety classes at St. Francis Hospital in Federal Way and suggests that parents actually crawl along the floor to help identify baby safety hazards. She emphasizes that parents can safety-proof their own homes and that it's crucial to trust your instincts. "If you walk by the coffee table and think you should move it, do it. Always listen to your instincts, because it's better to be overly cautious than to wind up in the emergency room," says Goeke. If you'd prefer to have a professional identify and make the necessary changes to your home, you can hire a baby-proofing company or a maintenance worker. Hiring a professional will give you peace of mind knowing that everything has been done properly. Goeke recommends new parents-to-be safety-proof their home before baby arrives. "Then they don't have to think about it afterwards, when they have other things on their minds," says Goeke. "If the baby is already here, make sure the safety changes are made before he or she reaches 4 months." Before stocking up on baby gear and toys, new or hand-me-down, Goeke suggests checking with the Consumer Product Safety Commission and stores like Toys "R" Us to find out about products that have been recalled for baby safety precautions. Sudden Infant Death Syndrome (SIDS) is the leading cause of death for babies between 1 month and 1 year of age, with most SIDS deaths occurring between one and four months, according to the National Institutes of Health. "Back to sleep" has become the slogan used to help new parents remember to put babies to bed on their backs. "Sleeping on their backs has already significantly lowered the incidence of SIDS," says Dr. Tom Hurt, a pediatrician in Tacoma. "When babies can roll, they will assume the position they prefer; but by then, the issue isn't as critical, because they are able to move their heads and avoid breathing problems by themselves." For complete baby safety precautions, experts recommend keeping pillows, comforters and other soft bedding out of the crib when baby is sleeping to prevent the possibility of smothering. According to Goeke, burns are the second leading cause of death for children younger than age 4, with most burns caused by scalding. Her baby safety recommendations include lowering the hot water temperature in your home to no more than 120 degrees, putting barriers in front of gas heaters and fireplaces to prevent little hands from touching the glass, and keeping fire extinguishers throughout the house. Parents and childcare providers should also keep hot beverages and foods far from a baby's grasp and avoid cooking or grilling while holding a baby to ensure great baby safety precautions. In addition to baby safety skills, Goeke teaches infant CPR and the choking prevention technique in her classes, both vital skills that every new parent should practice. 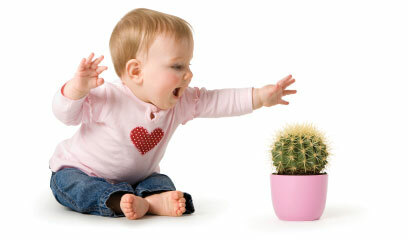 Because babies put everything in their mouths, parents need to be aware of what might be on the floor that could endanger their child and not leave a crawling baby unattended. Pennies, pet food, and other small objects can be choking hazards. "If an object will fit through a toilet paper roll, it is a choking hazard," says Goeke. "People are really surprised at how many toys are that small." To prevent strangling, it is safest to avoid bibs and baby clothes with drawstrings, and parents should keep babies away from cords of any kind. Safety experts also recommend that the slats of baby's crib be no more than 2 3/8 inches apart. In her classes, Goeke talks about how to prevent potential poisoning by removing look-alike products that might tempt exploring babies. For instance, Pine-sol® is the same color as apple juice, and window cleaner resembles blue Gatorade®. Even toothpaste, dishwashing liquid and other everyday products can present big problems in little hands. That's why it's important to keep baby safety emergency phone numbers, such as the Poison Control and your pediatrician, close to your home phone and programmed into your cell phone. Around 4 months of age, babies start rolling. Pediatrician Hurt says sometimes parents don't realize their child has this new skill until he or she falls off a bed or changing table, a common cause of injuries he sees in the emergency room. Parents should always keep one hand on baby while she's on an elevated surface, and consider using a changing pad on the floor for diaper changes to ensure baby safety. Hurt highly recommends that parents take advantage of the baby safety and CPR classes taught at most area hospitals. "Knowledge is power," he says. "If parents know basic CPR, they will be more confident at home and less likely to panic." Heather Larson is a freelance writer in Tacoma who also writes for Pregnancy magazine. 1. Make sure baby's car seat is installed properly. 2. Babies should ride in a rear-facing infant seat until they are 2 years old or until they have reached the weight and height limits of their car seat. 3. Babies must always ride in the back seat of a vehicle to ensure safety. 4. Don't use a cell phone while driving; to avoid temptation, consider keeping the phone turned off. 5. Don't take your eyes off the road to reach back for a dropped pacifier or toy. Heather Larson, a writer in Tacoma, enjoys visiting kid-friendly places in Washington with her grandchildren and and writing about their adventures.